Launching a podcast has never been easier. There are tons of tutorials out there that will walk you through the steps of recording and publishing a show. The real challenge is keeping it going. Showing up every week, coming up with content and putting out new episodes is time consuming. You might find that it’s a bigger time commitment than you initially anticipated. This is where a podcast editor can help. A good editor can save you hours of time every week by handling the editing and maybe even the show notes and admin work. 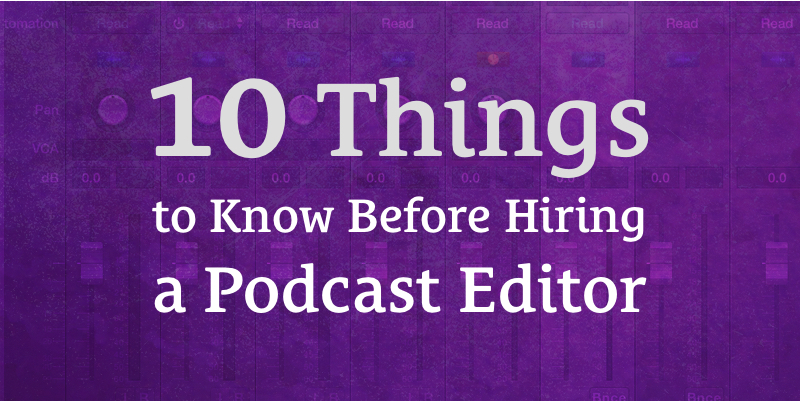 If you’re interested in hiring someone to help you produce your podcast, there are some important things you’ll need to know. That’s what I’m sharing in this episode. It’s important to clearly understand and define what responsibilities you would like to hand over to an editor. Communication is key. Invest time and money in your editor and they will take care of you. If you find the right editor, they’ll do the job of editing, mixing and mastering better and faster than you can. You get what you pay for. Don’t expect to get great work out of someone if you’re paying them minimum wage. Having a conversation is the best way to get a feel for how much experience someone has. Make sure you clearly communicate when you are going to record, when you are going to give your editor the files, and when you need the finished show file back. If you do need revisions, explain why so your editor knows what to do differently next time. 1:29 Robert asks: When do you know you need an editor vs doing it yourself? 1:39 It’s going to come down to three things; your available time, your experience level with audio, and your budget. Some of you may not be able to afford to pay someone to help you with your podcast, especially if you see your podcast as an expense instead of an investment in your future. 2:02 Podcasting can take up a lot of time. There’s no shortcut to make it quick and easy. As the old adage goes, you can have it fast, good, or cheap, but you can’t have all three. If you can afford to invest money in a podcast editor, they can save you a lot of time and energy. 2:21 I got my start as a podcast editor because I loved a certain show (Shoptalk) and I wanted to help them make their podcast better by helping with the editing, mixing and mastering. When I first started listening to Shoptalk, they were recording audio from Skype and publishing that with very little editing or mixing, so it wasn’t a very good listening experience. I thought I could help them make the audio quality better, so I reached out to the hosts and asked if I could work with them. They agreed, and that’s why I’m where I am today. 2:56 Listening to podcasts was (and still is) one of my favorite things to do, so helping other people make podcasts seemed like the logical next step. It felt great to be able to contribute to something I really cared about. 3:15 Eventually, I realized that I could make a living from helping people make podcasts. I put up a page on my website and started writing tutorials to help people but also to prove to potential clients that I knew what I was doing. My goal was always to help people make their podcasts better (and save them some time). Why Hire a Podcast Editor? 3:47 When I first started editing podcasts, I was mostly doing editing; putting the audio files together, cutting mistakes, false starts, Skype drops, long pauses, stuff like that. I also did mixing/mastering; EQ, compression, making sure the levels were right and everything sounded as good as possible. Even though I wasn’t very good at mixing/mastering when I started, I got better over time through practice and studying. If you can find the right editor, they can do the job of editing, mixing and mastering better and faster than you can. 5:01 There are a few other tasks that an editor might be willing to help you with, depending on who you hire and what services they offer. I ended up helping many of my clients by writing show notes, tagging the MP3 files, and helping with various other admin tasks. These are the kinds of things a podcast editor can do for you to save you time and effort so you can focus on other important aspects of podcasting like coming up with content, writing, and engaging with your audience. 5:30 I put together a list of questions to ask yourself, a few things you should know before you start looking for a podcast editor. 5:57 Write a list of all the things you’d like someone else to do for you. Depending on your budget, you may be able to find someone who is willing to help with admin tasks like tagging the MP3 files, uploading them to your site or hosting service, and writing show notes, in addition to editing the show. It’s important to clearly define what responsibilities you would like to hand over to an editor. 6:17 Cory asks: How do you find a podcast editor? You were the first one I had ever heard of, but I’m assuming it’s not an exploding job position. How can I make sure I get the best and not just some shmuck with an audio editor? 6:35 The truth is that I can’t point you to one specific resource to help you find an editor. You can do a Google search for podcast editor and check out some of the options, but the hardest part of finding a good editor is going to be finding someone who truly cares about making your podcast great. When I first started editing podcasts for money, I didn’t have much experience at all. I was figuring it out as I went. I believe I was successful because I started with the desire to help in any way I could, and I always tried to make my client’s shows as good as possible. Hopefully you can find an editor who loves podcasts as much as I do. 2. What editing style do you like? 9:08 Write down a list of the podcasts that you love. Do you want your show to sound like them? You need to know (and be able to explain) what the feel of your show is. Is it more like an NPR show, with a lot of storytelling and music in the background? Or is it a live-to-tape interview style show, where the conversation should flow naturally? 9:52 One style of editing I don’t recommend is jump cuts. This type of edit gives the effect of jumping forwards in time. This works well for for certain kinds of video, but I don’t like this editing style for audio, because listeners aren’t used to hearing people’s voices in that way. 10:44 Bryan asks: Does the content creator have any creative direction in the editing? 10:50 Of course! It’s your show! But if you record a 40 minute show and want it trimmed down to 20 minutes, your editor will need to have a clear understanding of which content to cut and why. You’ll probably need to work closely with them to explain your vision for the episode. You should also provide them with detailed notes about what should be cut and what should stay. On that note: I’m opposed to shows cutting good content just to meet a certain time limit. If it’s good content, it’s good content. If it’s relevant to the topic or funny, leave it. 12:13 Be aware that editing for content is more time consuming than just cleaning and polishing, so you’ll probably need to pay your editor a little more for this service. 3. What kind of experience does the person you’re talking to have? 12:34 Robert asks: If the prospective editor has sample work available for review, how does a lay person know what part of the podcast’s quality is due to good editing vs. good equipment/production value? 12:50 This is something that can be hard to judge. If a podcaster has great gear, a good room to record in, and experience with recording clean audio tracks at proper gain levels, the podcast editor may not need to do much mixing and mastering work. However, they may do a stellar job with editing for content. It may be hard to know how good an editor is just by listening to examples of their work. 13:31 You should ask this person about their experience with podcasts, audio and editing. Why are they interested in editing podcasts? When did they first start learning about mixing and mastering? Do they have headphones made for mixing, or studio monitors? Have they edited podcasts before? Do they listen to a lot of podcasts? What program do they use for editing? Do they know how to use plugins like equalizers, compressors, noise gates, etc…? Have they learned how to fix common problems like tracks that are too quiet or too loud? Are they familiar with the different kinds of audio files they’ll be working with? Do they know how to convert a split stereo track into two separate audio files? 16:45 Have that conversation and let them talk about their experience and why they want to help you with your podcast. Hopefully they want to help you produce a great show and not just get a paycheck. 4. Are you ready to give someone access to your website or file hosting account? 17:14 Many websites or podcasting services allow you to give access to other users. This is really great if you’d like to have someone help you with the admin tasks like uploading files or creating posts. 17:46 This might be something you do a little further down the road once you get to know the person a little better (got to be careful when handing over access to your website), but you should ask them if they know how to handle admin work like tagging MP3 files or writing show notes. You should also ask if they know how to write Markdown or HTMl, and if they are familiar with WordPress, Squarespace or Simplecast (or whatever hosting service you use for your website/podcast). You can save a lot of time by having someone handle the admin work for you every week. 18:22 How much can you expect to pay for these services? It’s hard to give you an exact number, because people charge differently based on experience and what value they believe they can provide to their clients. If you look on a site like oDesk or freelancer.com, you’ll find people charging between $8-25/hour. Some of the online services that specialize in helping people produce podcasts charge upwards of $200/episode. 18:56 When I started editing podcasts back in 2012, it wasn’t my full time gig. It was just something I was doing on the side. My day job was helping people make websites and graphics for around $15/hour. It was a struggle, trying to pay bills. My goal with podcast editing wasn’t to get rich, but I did need to make enough to pay bills, save 30% for taxes, and save money for the future. 19:50 When I started, I was charging between $50-$100 an episode. I don’t feel now that this was a sustainable amount. It would take me a couple hours to edit each show and do the show notes, and I wasn’t accounting for the amount of time I would be spending on general business admin stuff; sending invoices, emailing and helping clients. It’s also hard to do more than 2-3 shows in a single day (I don’t like to sit in front of a computer for longer than about 12 hours a day). I was billing my clients for the time I estimated it would take me to edit the shows, but not for the time I was spending on all the other things. This meant that I was only charging about half of what I should have been charging to make podcast editing a sustainable business long term. I wasn’t paying for health insurance or saving for vacations (or even time off). 21:20 I joke with my friends that I haven’t taken a day off in the past year, but that’s not that far from the truth. When you work for yourself, you feel pressure to always being working to bring in more money. Eventually, I realized that I needed to raise my rates. I don’t think I did it soon enough, but if I was going to get back into helping people make podcasts, I’d be charging something like $150/hourly, or $300/episode (depending on what services I’d be providing, of course). 23:32 In short, I would charge more and work with fewer clients. Charging less would mean taking on more clients to try to make more money, which would distract me from focusing on doing my best work for the clients I have. I’m telling you this because it was my experience and I want you to understand that you really do get what you pay for. You can probably find a college student with a little bit of editing experience, but if you don’t pay well, that person may look for other sources of income, or they may rush through the work to try to get it done faster. Invest time and money in your editor and they will take care of you. 24:23 If the person you’re talking to isn’t sure how much to charge, ask them to estimate the time they think they’ll spend on each episode, and how much they’d like to make per project, and then add 50% to that number. There’s a good chance they’re underestimating how much time they’ll be spending on your show. 25:19 Sean asks: What would you say to someone who got a cold email from a podcast editor whose rate is in the range that they can afford—should they go with them because the rate is something they can afford or should they be more critical? 25:34 I would see what services they’re offering and if they align with your needs, then have a conversation with them. Ask them if they listen to your show and why they reached out to you. Find out if they genuinely care about your show. If you get a good feeling from the conversation, try them out and see how it goes. 6. What is your record/release schedule? 27:20 Consistency is really important if you want to build an audience. It shows people that you’re going to show up regularly with new content. That consistency is important to your audience, but it’s also important for you because it can help you get into a groove. It becomes a thing that you make time for. It’s also really important for your podcast editor. 27:51 Robert asks: How do you establish expectations like turnaround time? What do you do if the editor doesn’t meet those expectations? 28:04 It all starts with communication. Your editor needs time to edit the show and send you the finished show file. This is especially true if you’re working with someone who has a different full time job and they’re just helping you to make a little money on the side, or if they have other responsibilities. 28:31 When I started, I told my clients that I could turn around a show in a day or two. After I started getting more clients, I had to change that to at least four business days for turnaround time. 29:01 It’ll also depend on your record and release schedule. If you record shows on Mondays, and you publish them on Friday, you’ll need to find an editor that can get the show edited during the week. You should also plan to have a time buffer in case you need any changes or revisions made to the file. 7. How are you going to share the files with your editor? 29:44 There are a variety of file sharing services, but I really like Dropbox and Google Drive. Many people are already using them, and they are an easy way to sync and share files. They aren’t free, so if you want a free service, check out Bit Sync. It works much like Dropbox but you don’t have to pay for additional storage space. 31:12 For organizing files, I recommend having a folder for raw audio files, one for finished MP3 files, one for show notes, and one for other assets. 31:31 Inside of the raw audio folder, create folders for each episode (1, 2, 3, and so on). That’s where you’ll put the raw audio files for each episode. It’s important to title your raw files correctly as well – I like files that follow a section+name format (example: intro-aaron.wav, or main-sarah.wav). If you have any notes for your editor, create a text file and include them in the episode folder. Don’t assume that your editor will read those notes, it’s ok to email them to let them as well. 32:26 Put music files, artwork and anything else that isn’t episode specific into the Assets folder. 32:35 The finished show files folder will be where your editor puts the finished episode files (self-explanatory, I know). 32:43 The show notes folder is where you can keep show notes for each of your episodes. Even if you don’t have someone helping you with show notes, it’s still a good idea to keep all the files related to your podcast in one location. 33:24 Make sure to let your editor know when you have the files uploaded, synced, and ready to be worked on. 8. What do you want the finished file format to be? 33:55 You have a couple of choices when it comes to the MP3 file that your podcast editor will send you after editing. For most podcasts, a 96kbps mono MP3 file is fine. If you want a smaller file size, ask for 64kbps. If you want slightly higher audio quality, ask for 128kbps. 9. How will you handle revisions? 36:47 Robert asks: How many iterations are typically acceptable? Is it one-and-done, or do most editors accept one or more iterations from the content creator? 37:06 As an podcast editor, I tried to get every podcast 100% perfect the first time, but sometimes changes still had to be made. When I started editing podcasts, I charged per project. This put stress on me because I didn’t have a system for dealing with projects that needed additional work or multiple revisions. Project-based pricing worked well until my clients sent me a file that needed a TON of extra editing work. There were more than a few times when I would spend 3-4 extra hours on a podcast episode because a guest was uncomfortable on the mic so they stuttered and used a lot of filler words. 38:27 It’s ok to ask for revisions, just make sure you are compensating your editor enough for any additional work to avoid stressing them out. Nothing is worse than spending 3 hours making changes to a project that should have only took an hour. That’s how people get burned out. 39:44 Understand that mistakes happen. No one is perfect, and sometimes there might be something that your editor missed or did wrong. When that happens, address it calmly. Let them know what they need to do differently next time. 10. How are you going to send payments? 40:19 Paypal is a very common way to send money over the internet. I used an online service called Harvest, which allowed me to easily create beautiful email invoices for my clients. Harvest allows Paypal and Stripe integrations, so my clients could easily make payments with Paypal or with their credit cards. 41:12 You should also agree to a payment schedule before you start working together. I used to invoice after every episode, but that got time consuming so I switched to monthly to save time. Ask your editor what works best for them.